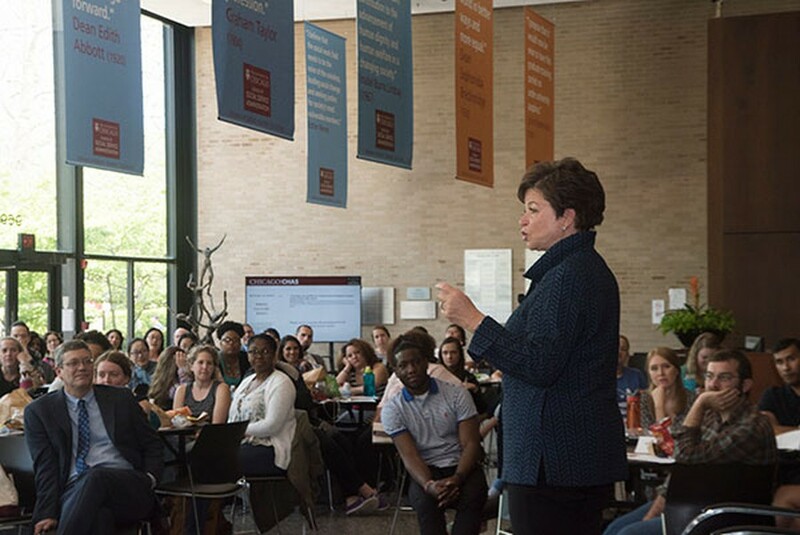 Former Senior Advisor to Obama Valerie Jarrett spoke to Harris School students at an event in May. Former top Obama adviser Valerie Jarrett will join the University of Chicago Law School as a Distinguished Senior Fellow, according to a Monday announcement. The appointment is believed to be the first of its kind in the Law School’s history, as Jarrett’s position will not focus on academics but is instead “intended to be about engagement with our community,” law school Associate Dean for Communications Marsha Ferziger Nagorsky told Crain’s. While Jarrett’s appointment is at the Law School, she will work throughout the University. Jarrett currently serves on the boards of Ariel Capital Management Holdings, Lyft, and 2U. Previously, she served as White House Senior Advisor, Assistant to the President for the Office of Public Engagement and Intergovernmental Affairs from 2009–17, director of the Federal Reserve Bank of Chicago and of Navigant Consulting, and as CEO of the Habitat Company. She began her work in politics in 1987 as Deputy Corporation Counsel for Finance and Development for then-mayor Harold Washington. “There’s no place like home,” she wrote.